On October 14th, Abraham Lincoln High School students, athletes, faculty, parents, alumni, athletic program boosters, neighborhood residents and several special guests celebrated the legacy of Lincoln High graduate and legendary African American sports figure Kenny Washington (August 31, 1918 – June 24, 1971) with a commemoration program that has become a yearly tradition. 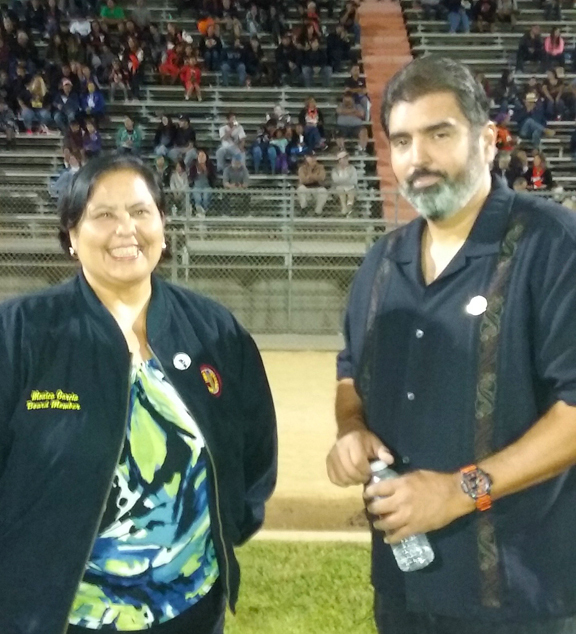 From the sidelines and the bleachers facing the gridiron overlooking Broadway Ave. near Mission Road, a home field crowd cheered loudly for their cherished Tigers in a dramatic match with the visiting Franklin High Panthers. Referred to locally as the “Battle of the Big Cats,” the game brings the long-standing North East Los Angeles rivals together for an emotionally charged, yet amicable contest of skill, strategy and raw talent. It is the most important game of the regular season for both teams. In 2011, the annual duel became even more significant as the first ever Kenny Washington Memorial Game. With support from the Kenny Washington Stadium Foundation (KWSF), this year’s Game VI provided a heart-pounding, action-packed backdrop for a half-time awards ceremony held on the grounds of the outdoor athletic complex that sits on the hilltop where the original school was built in 1913. With impressive views of the downtown LA skyline from a vantage point above the nearby streets and a few of the adjacent hills, it features a football field, a running track and a number of newly installed amenities. 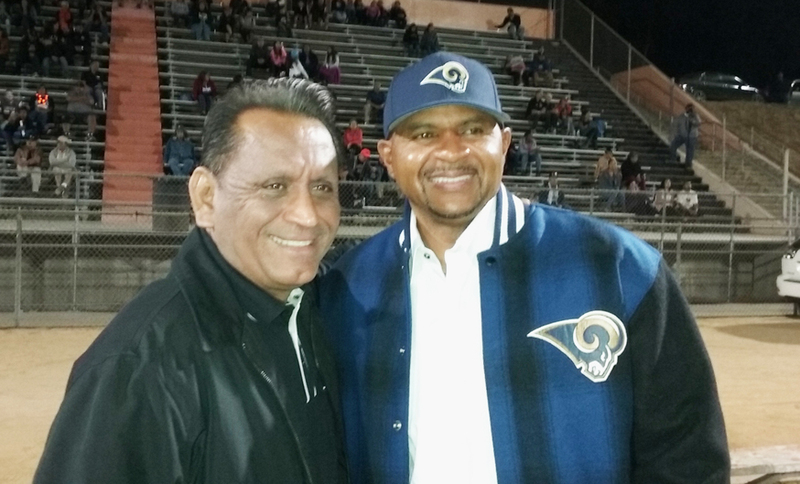 The facility face-lift is due, in part, to the efforts on behalf of Lincoln High athletics offered by the KWSF, the non-profit organization named in honor of the former Lincoln High running back who broke the NFL color barrier as the first black athlete to play for the Los Angeles Rams. 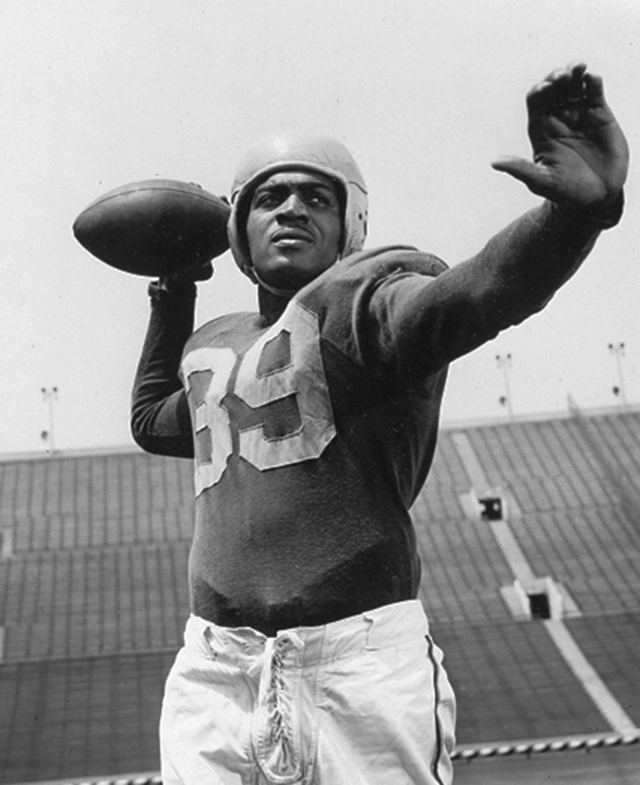 Contracted by the Rams in 1946, Washington ended an unspoken NFL racial segregation policy quietly enforced for 12 years preceding the moment he donned a Rams uniform and took to the field at the Los Angeles Coliseum. Though not often acknowledged, Washington effectively integrated the NFL a full year before Jackie Robinson heralded the integration of baseball in the U.S. when he was signed by the Brooklyn Dodgers. At Lincoln, Washington led the Tigers to a city-wide title and a championship before enrolling at UCLA, where he became the leading offensive player in the nation. In 1939, he rushed for a record 1,930 yards as a Bruin half-back during his senior year, but was barred from consideration during the NFL draft because of the unwritten rule excluding non-white players. Relegated to the all-black, semi-pro leagues from 1941 to 1946, he had already undergone five knee surgeries by the time he was invited to try-out for a position on the Rams offense. After three years with the sports franchise which had come to Los Angeles from Cleveland, the cumulative effect of his sports-related injuries triggered his retirement from football altogether. By most accounts, Washington’s invitation to seek a position on the original Los Angeles Rams offense was a reaction to pressure from L.A.’s influential African American sportswriters on both Rams management and the L.A. Coliseum Commission. When news that the Cleveland Rams were headed to Los Angeles to meet with members of the L.A. Coliseum Commission about the possibility of a permanent move to Southern California, a number of locally-owned black publications launched a concerted effort to sway public opinion with articles and editorials on the moral and legal justifications for ending the NFL lock-out of black athletes. Because the Coliseum had been built with taxpayer money and African Americans paid taxes, black journalists insisted, any club seeking to profit from sporting events held there was obligated to prove they were not party to the informal rule barring black athletes by hiring at least one African American football player. Native son Washington was an obvious choice as a favorite across the entire city and among all Angelenos. In many ways, Sariñana-Lampson explains, Washington’s story is paralleled by the community efforts to overcome decades of LAUSD neglect that had left Lincoln High School’s athletic and physical education programs flailing in the wind. According to him, a group of former Lincoln High varsity athletes found themselves on the sidelines of the athletic field at their alma mater sometime in late 2010. They were dismayed by what they saw. “We looked around and then asked each other, ‘man, what happened to this place?’ recalls Sariñana-Lampson. The physical deterioration, unmitigated environmental erosion, foliage overgrowth, evidence of illegal dumping and an obvious lack of basic maintenance motivated the group of friends to begin reaching out to gauge interest in addressing the issues directly. “That’s when we started forming [as the Foundation],” he says. Gradually, he and his cohorts realized that their concerns were shared by a vast community of stakeholders who also shared a connection to the school and who were eager to follow up with an intervention of some kind. In March of 2011, they came together for a community clean-up of the site with a focus on the hundred year-old tennis courts, which had fallen into such disrepair that they were hardly recognizable. The clean-up, says Sariñana-Lampson, drew more people than anyone could have expected. Among those who showed up, he says, were former California Senator Gilbert Cedillo and Sal Castro, a former Lincoln High teacher who had led the Chicano student walk-outs a generation before in protest of unequal resources allocated to East Side schools by the school district and discriminatory teaching practices that discouraged Mexican American students from pursuing college preparatory classes. “I can’t tell you how much it meant to see those guys there helping us clean-up,” Sariñana-Lamspon continues. During his research on the history of his alma mater, he adds, he learned that the Lincoln High School erected in 1913 was established to accommodate students who were transitioning out of what had previously been the 21st Street Intermediate School. Inspired by middle-schoolers from a century before, Sariñana-Lampson and his colleagues decided new basketball rims with nets would be a great addition to the hilltop park. “After the clean-up, we decided to put up hoops, and the school board complained. I got called in for a meeting,” he says. “I was prepared with photographs, documentation and research,” says Sariñana-Lampson. Los Angeles Unified School District staff said they could not permit unsanctioned improvements to the athletic complex for several reasons, chief among them the natural erosion which made the hilltop unstable and incurred liability the district was not prepared to assume. “I have a master’s degree in architecture from Berkeley, so I told them how they could address the erosion,” he continues. Ultimately, he adds, LAUSD relented and later even allocated approximately $500,000 for a spate of improvements at Lincoln. During half-time at the Kenny Washington Memorial Game VI, Sariñana-Lampson invites the honorees and special guests to a small platform. The “Hero” Award is presented to the Lincoln High varsity basketball team, which earned a title as the 2016 City Champs and became the first Tiger team to appear in the CIF State Championship Play-off. A Lincoln Heights-based service organization since 1969, EL ARCA, INC. provides special and extraordinarily gentle care for the developmentally challenged. The group is honored as the recipient of the 2016 “Legend” Award. The “Pioneer” Award provides the highlight of the ceremony. Driving himself and his wife Henrietta in from La Quinta, California, 93-year-old Jim Hardy bounds onto the small stage. As the only surviving member of the original 1946 Los Angeles Rams, Hardy recalls his late friend and teammate with sincere admiration, sharing stories about Washington from both on and off the field. A Fairfax High graduate, Hardy attended USC and captained the Trojans as quarterback, leading them to consecutive Rose Bowl victories in 1944 and 1945 before being drafted by the NFL. As much as Jim Hardy, who drives two hours each way to and from USC once a week to watch the Trojans practice, is a hard act to follow, LAUSD Board Member Monica García steps it up with her own burst of kinetic energy in honor of Lincoln-lifer Michael “Flash” Gordon. Recently retired after a 55-year run as a social studies instructor and the most spirited athletic director the school has ever had, “Flash” still contributes, says Sariñana-Lampson, by managing the snack bar during home games. “All the proceeds go directly to the athletics program,” he adds. At the end of half-time, after celebrity guests Kysa Williams—Kenny Washington’s granddaughter and a Foundation board member, Olympic Gold Medalist and former Los Angeles Rams wide receiver Ron Brown and all-time leading UCLA running-back Johnathan Franklin have patiently posed for an almost non-stop barrage of selfies and group photos with fans, the Tigers and the Panthers square off again. By the third quarter, the Tigers have moved ahead with a solid 14-point lead (27 – 13). But in a surprise comeback, the powerful Panther offense kicks in to tie the game. The Tigers finally take the game in overtime, honoring the spirit of Kenny Washington in the best way the exhausted young athletes know how, by shaking hands with their equally tired opponents and congratulating them on a great game in a show of remarkable sportsmanship. Lingering somewhere beneath the light of the moon hanging above the hills of Lincoln Heights, the spirit of Kenny Washington must be smiling. Pictured from top left: Kenny Washington, Courtesy of NFL archives; Councilmember Gil Cedillo (l.) and former Rams receiver Ron Brown; LAUSD Board Member Monica García (l.) and Kenny Washington Foundation President Stephen Sariñana-Lampson.